A cobra is a venomous snake that lives in Asia and Africa. Most of the time a cobra resembles any other snake, but it can also rise up and flatten its head into a "hood." This hood is the cobra's trademark. The cobra's hood is created by many elongated ribs that are capable of extending the looser skin on the neck outwards. The cobra rises up on the forward portion of its body and flattens its neck, spreading out this skin on the ribs to create what appears to be a hood. Cobras do this whenever they are disturbed or feel that they are in danger. By doing so they can make themselves look larger than they really are and potentially unnerve a predator or foe. There are several types of cobras living in various parts of the world. Water cobras can be found in Central Africa and reach lengths of up to 7 feet. Burrowing cobras are smaller, just 2 feet long, and reside in the Congo and Cameroon. Tree cobras are known to live in central and western parts of Africa, and can exceed 9 feet in length. The largest venomous snake in the world is the king cobra, which can grow to 18 feet in extreme specimens. They reside in southern Asia, particular in India, Vietnam, Malaysia and Indonesia. Cobras will attack if provoked or threatened. However, the cobra sometimes will "fire blanks," meaning that it doesn't always get venom into its victim with its fangs. Cobra bites are fatal about 10 percent of the time in humans, as the poison will cause respiratory failure and suffocation by affecting the muscles in the diaphragm. The bite of a cobra, if it delivers a full dose of venom, can kill in as little as half an hour. 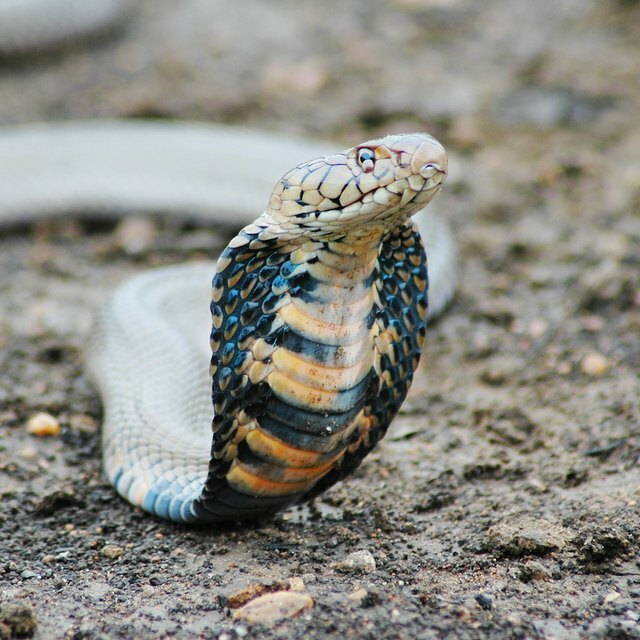 Of all the snakes, only the king cobra female builds a nest and then guards its eggs. 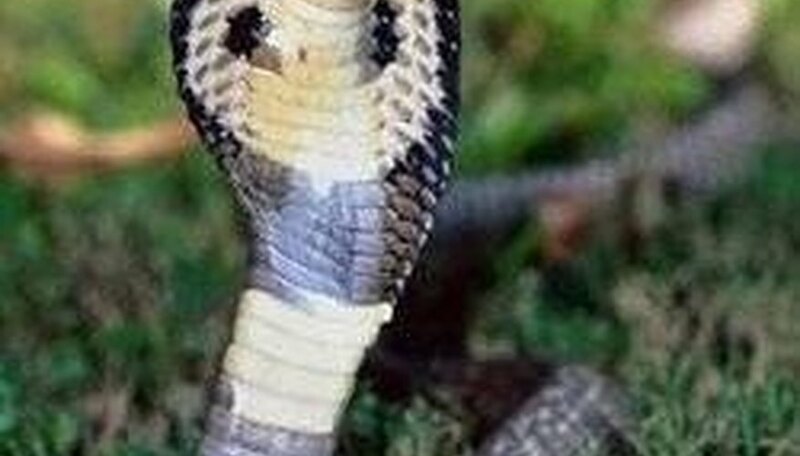 The king cobra eats other snakes almost exclusively, including pythons and other cobras. Its main predators are human beings, birds of prey and the extremely agile mongoose, which is one of the only animals fast enough to be able to attack it effectively. Some species of cobra are called spitting cobras because they can "spit" venom at their enemies. This venom is often aimed at the eyes and it is very painful when it connects with the target. However, it does not immediately cause blindness--it can make the victim blind if left untreated, but if washed out promptly, there are no lasting effects. The snaked do not actually spit the venom; they contract their venom glands with powerful muscles that force the venom out through a pair of holes at the tips of the fangs. Lindell, John. "Why Does a Cobra Have a Hood?" Sciencing, https://sciencing.com/why-does-cobra-have-hood-4588328.html. 24 April 2017.